Ian Thurnwald, one of the founders of Astrology on the Web, has been practising the art of astrology for over a decade. His main areas of interest are personal and mundane forecasting, synastry, and traditional astrology. This article examines the traditional astrological categories of elements and qualities, viewed in a context of northern versus southern orientation. Ian lives in Adelaide, South Australia. This in-depth article, by leading astrologer Ian Thurnwald, outlines the traditional system of elemental qualities as it applies to the Astrological elements and to the triplicities of the signs and the seasons of the year. Ian also develops a new method based on Aristotle's conceptions of "being and becoming" to apply the seasonal qualities in a more meaningful way to Southern Hemisphere births. In the first place, I hope to show that this original means of classifying the signs helps us to gain more understanding of the basic nature of the signs of the Tropical zodiac. Secondly, we shall explore the obvious implication of this seasonally based system for people born in the southern hemisphere, namely, that with the reversal of the seasons in the southern hemisphere the expression of the signs is altered somewhat. Finally, I'd like to demonstrate a practical use for this system, as a way to delineate basic temperament from natal charts. The elements as used in Astrology are of Classical Greek origin and have the same meaning as they had in Greek cosmology and science. For the Greeks just about anything, from natural processes to human temperament, could be classified as being of the nature of either air, fire, earth, or water. The Greeks, however, always utilised two sets of opposites, the elemental qualities, hot and dry, cold and wet, to describe the elemental components of whatever they were categorising. An example of the reasoning would be; steam is predominantly active (hot) and formless (wet), so it is of the nature of air. 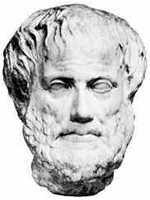 The most complete version of this system was put forth by Aristotle around 350 B.C.E.. Aristotle proposed that the elements were combined of the qualities in such a way that one element could change into another through a cyclic process. The model for this process of change was the cycle of the seasons. These ideas were fully developed before Astrology entered the Greek world. This is one reason why Astrology was so readily taken up by Greek intellectuals of the day. For the Greeks there was no separation between nature and human experience. Like contemporary indigenous peoples, they saw humans and nature as part of the same continuum. As such, Greek theories of the natural world attempted to explain observable reality in terms of the behaviour of natural processes as modelled on human behaviour. Thus, the Greek "elements" of air, fire, earth and water, were never thought of as the physical or chemical building blocks of matter, rather they were characterisations of modes of behaviour, activity, or process (Robert Hand, 1981:184, Horoscope Symbols. Whitford Press: West Chester, PA). The earliest Greek ideas about the natural world appear around 550 B.C.E.. We will not attempt to explain them here except to note that the central notions of "elements" and "qualities" were established at this time. At this early stage the four elements of air, fire, earth and water were seen as immutable, and all things were said to come into existence as a result of a battle between two sets of opposite qualities; the warm and dry versus the cold and moist. Two-hundred years later (around 350 B.C.E. ), Aristotle's model of the natural world had wide currency. In terms of this model each element is a combination of two of the four opposites, and everything in existence is a temporary compound of the four elements in different proportions, with the tension between opposites being the force that keeps things together. All these ideas were an established part Greek thinking before Astrology took hold in the Greek world. In other words Astrology fitted in very well with the cosmology and philosophy of an agrarian society that saw change as a process similar to the cycle of the seasons. In terms of this schema, hot and cold are descriptive of different states of energy or activity, hence they are the "active" qualities. Thus, a hot (or warm) entity is in motion while a cold one is at rest. Hot things, then, are warm, bright, they expend energy, are rapid in motion and changeable. Cold things, on the other hand, are cool, dark, they conserve energy, are deliberate in motion and tend to stay the same. Wet and dry are terms that also carry the connotation of "soft" and "hard". They are descriptive of different states of matter that are acted upon, hence they are the "passive" qualities. Thus, a wet (or moist) thing can be soft, malleable, moist, or formless, while a dry thing can be hard, brittle, parched, or solid. This system is used to make distinctions between the nature of things of the same class, and as a means of making distinctions between things. An example of the former is food which can be described as cooked (hot), raw (cold), soft (wet), or hard (dry). An example of the latter is spatial relationships, where high places are said to be hot and light and low places are cold and dark. It is also worth noting that the Greeks already had developed a proto-psychology based on this system where the elemental qualities applied to four humours or personality types: Sanguine (wet & hot), Choleric (hot & dry), Melancholic (dry & cold), and Phlegmatic (cold & wet). In terms of this schema then, anything could be described as a combination of its active quality and its passive quality. The application of the system of elemental qualities to Astrology has two major consequences. First, it provides us with a deeper symbolic understanding of the elements, which helps us to better understand the nature of the signs. Second, by including the elemental qualities of the seasons as an important component of the meaning of the signs, the system explains why there are differences in expression between signs of the same element. 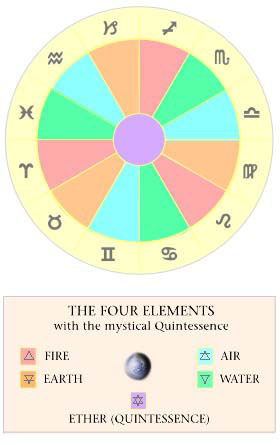 As to the first point, using the elemental qualities in Astrology shows us that each element is a mixture of two qualities, for example, the element, fire, is a mixture of hot & dry. Hence we gain deeper insight into the inherent nature of the triplicities, for example, all fire signs are hot & dry. Let's briefly explore some of the symbolic implications of this. Signs that are hot in nature, the fire and air signs, put out energy and are quick to act, their focus is on the people and things around them, they are excitable and behave in an enthusiastic manner. Signs that are cold in nature, the earth and water signs, draw in energy and are slow to act, their focus is on their own thoughts and feelings, they are controlled and behave in a dispassionate manner. Signs that are dry in nature, the fire and earth signs, are tense and nervous, they relate by differentiating themselves from others; they think in an analytical or concrete way, by making distinctions, breaking bonds and separating things out into their unitary parts. Signs that are wet in nature, the air and water signs, are flexible and relaxed, they relate by connecting with others; they think in a creative or abstract way, by blurring boundaries, making connections and bringing things together as a unified whole. In the table we can see, for example, that all the fire signs are by their very nature hot and dry. However, the addition of the elemental qualities of the seasons results in differences between the fire signs. Leo being the midsummer sign gets a double dose of hot and dry and is the pure fire sign, but Aries being a Spring sign is wetter (hot & dry, hot & wet), and Sagittarius being an Autumnal sign is colder (hot & dry, cold & dry). Obviously, this both explains and helps us to better understand the differences between signs of the same element. In the case of the fire triplicity, we see that: Aries is as active (hot) as Leo but it is more sociable (wet by season) than either Leo or Sagittarius; that Sagittarius is as discriminating (dry) as Leo but it is less assertive (cold by season) than either Aries or Leo, and; that Leo is the pure fire sign—it puts a lot of energy (hot) into establishing its own distinctiveness (dry). Tropical Astrology in the Southern Hemisphere? In the Southern Hemisphere (hereafter SH) the seasonal cycle is reversed. If the elemental qualities of the seasons are crucial in determining the distinctions between the signs of the zodiac, as seems to be the case, then the way people in the SH go about expressing the energy of the signs will be different. Of course, if we hold that Astrological symbolism is universal, despite its origins in the temperate climes of the Northern Hemisphere (hereafter NH), then this point is irrelevant. But if we hold that Astrology is just as much about place as it is about time, that our experiential relationship to place is important, then this is an idea worthy of serious consideration. Now, it is important to notice that the basic nature of the signs remains the same (i.e., an Aries is still an Aries), but the seasonal difference means that the mix of elemental qualities does change. Theoretically, this will bring about a change in the way a SH sign goes about expressing itself, even though the intrinsic nature of the sign has not changed. Before outlining the probable difference in expression of each SH sign, it is worth highlighting the main points of difference between the elemental mix of NH and SH signs. First, many of the signs merely swap their mode of expression with another sign of the same triplicity. We see this below in relation to the signs: Aries and Sagittarius, Gemini and Libra, Virgo and Capricorn, and Cancer and Pisces. Second, the three pure signs in the NH, Leo, Gemini, and Pisces, become mixed signs in the SH. Meanwhile, the three mixed signs in the NH, Taurus, Cancer, Libra, become pure signs in the SH. Thus, the SH loses the pure fire sign in Leo, but gains a pure earth sign in Taurus. Third, the SH signs that differ markedly from their NH namesakes are, as one would expect, those that fall in the middle of their respective seasons, namely, Leo, Taurus, Scorpio and Aquarius. Gemini is the pure air sign in the north (hot & wet, hot & wet), but in the south it becomes a mixed sign having all the qualities (hot & wet, cold & dry). A southern Gemini then, is less energetic and has all four qualities to express. This Gemini tries to be all things to all people. Libra in the south is the pure air type, the ultimate air sign; an enthusiastic type that likes to move about and socialise. This Libra is the "life of the party". Aquarius in the north is basically wet (hot & wet, cold & wet), however in the south it much warmer and drier (hot & wet, hot & dry). A southern Aquarius then, is very energetic and is more of an "ideas person" than a "team player". Leo is the pure fire sign in the north (hot & dry, hot & dry), but in the south it becomes a mixed sign having all the qualities (hot & dry, cold & wet). A southern Leo then, has all four qualities to express but with less energy to do so. This is a more relaxed and genuinely gregarious Leo. Sagittarius in the north is basically dry (hot & dry, cold & dry), however in the south it is much hotter and wetter (hot & dry, hot & wet). A southern Sagittarius then, is a very energetic sign and is more sociable than its northern namesake. Aries in the north is basically hot and wet (hot & dry, hot & wet), however in the south it is colder and much drier (hot & dry, cold & dry). A southern Aries then, is less energetic and more dogmatic than its northern namesake. Taurus in the north is a mixed sign, warmer and wetter than one would expect of an earth sign (cold & dry, hot & wet). But in the south Taurus becomes pure earth (cold & dry, cold & dry). A southern Taurus then, is quite staid, materialistic and insular. Virgo in the north is basically dry (cold & dry, hot & dry), however in the south it is much colder and wetter (cold & dry, cold & wet). A southern Virgo then, is less energetic, less critical and more sociable than its northern namesake. Capricorn in the north is basically cold and wet (cold & dry, cold & wet), however in the south it is warmer and much drier (cold & dry, hot & dry). A southern Capricorn then, is more active, more realistic and less sociable than its northern namesake. Pisces is the pure water sign in the north (cold & wet, cold & wet), but in the south it becomes a mixed sign having all the qualities (cold & wet, hot & dry). A southern Pisces then, has all four qualities to express but has a little more energy to do so. Cancer in the south is the pure water type, the ultimate water sign; low energy, flexible, communal. Scorpio in the north is basically cold (cold & wet, cold & dry), however in the south it is as warmer and much wetter (cold & wet, hot & wet). A southern Scorpio then, is slightly more active, less analytical, and more sociable than its northern namesake. Since the elemental qualities apply to the signs we can also say that they apply to the planets placed in the signs of the horoscope. A practical application of this system, then, is that we can list the sign placements of the planets in a natal chart and tally up the elemental qualities of the planets by sign, as well as by season, to see what overall characterisation better fits the person. In terms of the elemental qualities of the signs, the President's temperament is an even balance between sanguine (hot & wet) and choleric (hot & dry). However, when the elemental qualities of the seasons are taken into consideration Bush is most definitely choleric—a fiery type, a high energy person who acts to express his own power and will in the world. In support of the sanguine characterisation, it could be said that 'dubbya' has a certain way with words! He also seems to get along very well with the Russian President, Mr Putin (a Libran). On the choleric side, however, Bush keeps fit by 'pumping iron' (very choleric), and his leadership style is that of the company director—he relies on advisers to understand and analyse issues, then makes his decision on the basis of their findings—not a particularly sanguine approach.